Announcing the release of my latest fiction offering (following my previous post and waiting for the KDP process to filter its way back to my inbox). 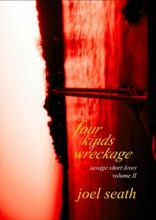 Four Kinds of Wreckage (Savage Short Loves: Volume II) is available for purchase via the bookshop link on the left-hand side bar. At the start of this particular writing process, I didn’t envisage a year long project in all honesty. The previous instalment of this series took the best part of three years to come to fruition, but Volume II was intended to be a quicker write. What we learn along the way is that words won’t be rushed. As a taster of the contents of this second volume (and something I haven’t yet done in order to promote the contents of the first volume), there follows at the end of this post a very brief overview of the thirty pieces therein. I call them ‘pieces’ because I always have: they’re not stories in the conventional sense of the definition (by which I mean, the view that such writing has a ‘beginning, middle, end, plot, crucible/conflict’, and so forth); these pieces, in their intentional brevity, sometimes have a storyline to them, are sometimes a moment in the telling, sometimes they’re the middle of things that might expand out in the mind, etc. How to write a synopsis of such brief affairs (being in the region of 60-1000 words per piece)? The succinct, below, shall describe the brief. Prices have been reconsidered to reflect the individual work in question, but I’m open to the idea of a free copy coming your way if you drop me a line on my Joel Seath: Writer Facebook page, or send a message on this blog site. This free giveaway is for promotional purposes and therefore with a limited initial period (if it’s successful, I’ll do likewise again sometime). So, contact me by January 17 please. As the independent writer/publisher’s promotional work is aided by honest reviews, you’ll know then — as a reader — that a review of the book is requested in return for a free copy. There is a reviews page set up on this site for readers’ comments. I thank you kindly in advance of your interest. Peace be to my readers (here on the blog and there in my books). This entry was posted in Book Releases and tagged book releases, ebook, ebooks, fiction, four kinds of wreckage, in memoriam, literature, short stories, stories, writing.